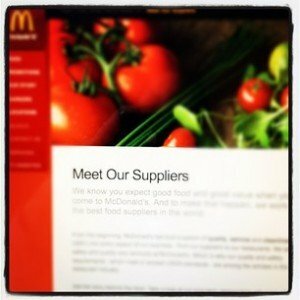 Do We Care about the McDonald’s Suppliers? As many of you have seen, McDonald’s is running a campaign about their suppliers – potato, lettuce and beef so far – emphasizing the American multi-generational story. Many food providers are highlighting their local suppliers and cookbooks and magazine articles are dedicated to this trend wholeheartedly. What is it about the McDonald’s campaign that seems so disingenuous then? Certainly all types of restaurants and food providers have suppliers. But in today’s vernacular, talking about suppliers has become synonymous with talking about local, fresh, organic foods. The Farm Fresh movement has taken form to the point where we cannot go to our local Whole Foods or restaurant without hearing about the local suppliers and partners who work hard to bring fresh food to consumers and eaters. McDonald’s does not typify the local neighborhood restaurant, but they are not claiming to in these videos. They are simply claiming to have suppliers. However, because our terminology for that word is ingrained with preconceived notions, McDonald’s using it seems disconnected with the larger supplier conversation. Why do we eat at McDonald’s? I’m a busy professional and can attest to the fact that McDonald’s serves a purpose for me. All my dining experiences cannot be at fancy places like Tico or Toro or even Russo‘s. So, I get why we eat at McDonald’s. But it is not because I expect “good food” when I go there. I can say I don’t want them to choose poor food and I still have a level of expectation that they source in a smart manner. However, I am not immune to the fact that they have fully transformed the meat industry and even re-engineered the potato so their fries look better in their environmentally improved holder. What I do care about though is that the food is safe, hot, fast. I care about the service being clean, efficient, kind. I do not really care about their suppliers in the same way that I care about the suppliers to Whole Foods. McDonald’s has been around since 1940 and is the largest chain of hamburger fast food restaurants. They are doing something right. What makes them successful? Lower costs because of the high purchasing power they have? The ability to innovate and keep loyal consumers happy with the McRib and Monopoly? McDonald’s has an extensive consumer research group that can recognize patterns in order to meet the needs of their customers. Is there a nugget of information in there that is specific to McDonald’s consumers that would prove a more believable and effective story? What impact will the supplier videos have on McDonald’s top line?